ST. PETERSBURG, Fla. -- Minor League Baseball announced today that the San Jose Giants are the recipients of the 49th annual Larry MacPhail Award, symbolizing the top promotional effort in Minor League Baseball. The award has been presented since 1966 and is named after Hall of Famer Leland Stanford "Larry" MacPhail, Sr., who introduced innovations such as night baseball, airplane travel, pension plans and batting helmets. This is the first time the San Jose Giants have earned this honor in the award's history and only the second time for a California League team. The San Jose Giants will receive their award at the Baseball Winter Meetings Banquet on Sunday, Dec. 7, at the Hilton San Diego Bayfront in San Diego, California. With an innovative approach of engaging fans through social media, a mix of community-centered events and exciting theme nights, the organization saw their sixth straight season with more than 200,000 fans entering the Municipal Stadium gates. Through the San Jose Giants extensive work with youth sports groups, schools and regional non-profit organizations, the team has introduced baseball to millions of homes in Northern California. "The 2014 Larry MacPhail Award is the culmination of the entire organization's commitment to excellence in marketing and promotions," said Juliana Paoli, San Jose Giants Chief Marketing Officer. "We strive to be at the forefront of the baseball community, and it is truly humbling to have others, not only in our league, but throughout Minor League Baseball, recognize our efforts. I am proud of the steps we took as a team in 2014 that propelled our organization to unmeasured heights. We look forward to using this prestigious honor to continue to positively impact the Minor League Baseball community in the future." "Through a variety of memorable on- and off-field promotions and events, the San Jose Giants demonstrated that the promotional aspect plays a vital role in every Minor League Baseball organization's overall success," Pat O'Conner, President & CEO of Minor League Baseball, stated. "They effectively utilize outlets including social media, the support of their parent club and leverage in the community to provide unforgettable experiences to their fans. Congratulations to the San Jose Giants, and on behalf of Minor League Baseball, I commend them on an outstanding season." 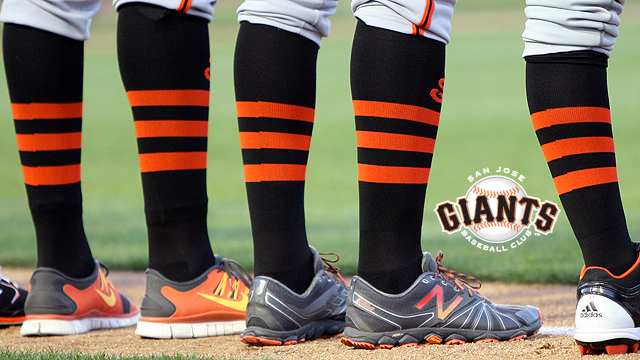 The San Jose Giants promoted and organized a number of theme and heritage nights this season. During their opening homestand, the team hosted the third annual Salute to the Military Day, presented by Operation: Care and Comfort. All current or former military personnel received free tickets to the game, and the first 250 were given care packages. In addition, the first 1,000 fans in attendance received a special Military Trading Card Set. The 36-member set was made up entirely from fan nominations of current and former members of the military. Italian Night, Hawaiian Night, Mexican Heritage Night and Japanese Heritage Night also filled San Jose's promotional calendar. Social Media Thursday #TBT, Boy Band Night, Star Wars Night and Mustache Night provided fans fun opportunities to interact with the team on social media, dress up and enjoy a baseball game. The team was aggressive and proactive in their community outreach and charity ballpark events in 2014. Fan-favorite jersey auctions highlighted the home schedule with a team-record nine special event jerseys. Proceeds from auctions held on Breast Cancer Awareness Night, Relay for Life Night, Cinco de Mayo and Italian Night all went to local charities. The team held a number of non-gameday events in 2014. For the third consecutive year, the organization hosted the San Jose Giant Race, a run featuring 5 Mile and 5K courses that finished on the field at Municipal Stadium. A record number of nearly 2,200 runners took part in this year's race. Additionally, more than 140 boys and girls, ages 7 to 14, took part in the San Jose Giants Summer Camps at Municipal Stadium. The ballpark also served as a meeting spot for Fortune 500 companies' corporate events, and for a national advertising commercial, hosted a youth conference and was used by Operation: Care and Comfort for military events. The San Jose Giants Bay Area Self Storage Baseball Buddies program afforded young baseball and softball teams unique baseball experiences. Each Baseball Buddy could get player autographs and have the once-in-a-lifetime opportunity to take the field with the San Jose Giants. Fan-favorite in-game promotions, including Race the Mascot, Smash for Cash, Gigante showcasing his latest dance moves, the Beer Batter and Victory Balls entertained fans at Municipal Stadium throughout the season. In 2014, the San Jose Giants celebrated their 27th season of San Francisco Giants affiliation, the longest in the California League. With 125 former San Jose Giants making their Major League debuts in San Francisco, the organization celebrates its affiliation utilizing the tagline, "See the future now at Municipal Stadium." The team bus was fully wrapped with cutouts of former San Jose Giants who were part of the San Francisco Giants World Series teams. The team's most anticipated giveaway weekend featured a Buster Posey Gnome and Bruce Bochy Bobblehead and was branded as the #BochyandBuster #B2B #GiveawayWeekend. Leading up to the giveaways, the team posted pictures of the giveaways at various landmarks and sponsor locations on social media. Fans could enter to win tickets by using the hashtag and guessing the giveaway locations. On Aug. 21, the San Jose Giants hosted an #ALSIceBucketChallenge Auction to benefit the local ALS Emergency Treatment Fund (ALSETF). Fans had the opportunity to bid on the chance to douse their favorite player with ice water following the game. The organization involved a number of sponsors, media members and local politicians to participate with the team in the Ice Bucket Challenge auction and raised nearly $2,500 for ALSETF. The team's promotions, giveaways and special theme night jerseys also created excitement on social media. In one calendar year, the team's Facebook 'Likes' increased by more than 70,000, Twitter followers by nearly 3,000 and Instagram followers by more than 1,500. This growth catapulted the San Jose Giants from the 25th ranking in October 2013 to inside the Top 5 in all of Minor League Baseball's Social Media Rankings in 2014. "It is a tremendous honor for our organization to win the Larry MacPhail Award for the first time in our history," said Mark Wilson, San Jose Giants General Manager and Chief Operating Officer. "I am very proud of our marketing efforts, especially as one of the groundbreaking organizations on the social media front. Considering a decade ago we did not have a marketing department, it is a true testament to Juliana's vision, as well as her team's dedication and hard work, for Minor League Baseball to give us this honor." "The San Jose Giants are one of the premier organizations in Minor League Baseball," said California League President Charlie Blaney. "They have clearly put themselves in a special place within the community with the tremendous quality and number of promotions and marketing events they put forth in 2014. They are a deserving recipient of this honor." The San Jose Giants are a professional baseball team in the Class A Advanced California League. The team has been affiliated with the San Francisco Giants since 1988 and has boasted one of the best records in the minor leagues after partnering with the big league club, going 2098-1673 (.556). San Jose has won six California League Championships as a Giants affiliate (2010, 2009, 2007, 2005, 2001 and 1998) and 11 overall. In 27 seasons, the San Jose Giants have graduated 173 Major League players, 125 of whom have played or currently play for the San Francisco Giants. 16 former San Jose Giants took part in the 2014 World Champion San Francisco Giants playoff run. The San Jose Giants have played in historic Municipal Stadium for more than 70 years. The Giants won back to back league championships in 2009 and 2010 and are also the first team in California League history to have won four titles over a six-year span. For more information, visit sjgiants.com.